How will the withdrawal of US troops affect Afghanistan? US President Donald Trump’s surprise announcement about withdrawing American troops from Afghanistan has already had implications. The decision has forced Trump's Secretary of Defence Jim Mattis to resign citing policy differences. In a message on Twitter, Trump declared: "after historic victories against ISIS, it’s time to bring our great young people home!" This instantly exposed the American political divide as many politicians rallied to voice their opinion regardless of the partisan views. Republican senator Lindsey Graham claimed he had been "blindsided" by the sudden announcement, while Democrat Nancy Pelosi said the decision was based on "personal or political objectives" as opposed to "genuine national security interests". Despite the critics, Trump also had support from leaders on both sides of the aisle with Democrat senator Ted Lieu pointing out that "none of those war actions were authorized by congress," and asking opponents "wow much endless war is enough?" Senator Rand Paul cautioned: "all of the naysayers in Washington will be against him. But, guess what? If you ask the American people, this is why President Trump won the election." Meanwhile, Ro Khanna said in a statement that "Trump’s instincts to withdraw are correct, but the tactical implementation matters." So what are the "tactical implications" of Trump’s decision on the United States' longest running war in Afghanistan? While the US maintained a reported presence of just around 2,000 troops in Syria, including special forces, there are about 14,000 American soldiers in Afghanistan with half of them logistics troops and trainers. Media reports suggest 18 US soldiers died in combat this year, with top US commander Gen. Austin Miller narrowly surviving an attack on his life in October. According to the US Department of Defense, 2,216 American soldiers have been killed in action in Afghanistan and more than 20,000 wounded since 2001. Add to this 28,529 Afghan security personnel killed in Taliban attacks, cross-fights and "collateral damage" since 2015. An estimated 2,798 civilians killed and 5,252 others wounded in countrywide attacks this year, according to UN. Reports suggest Taliban control more territory than at any point since the removal of their regime 17 years ago. Given all of this, why does the United States want to leave, knowing full well that the land-locked central Asian nation has never been as insecure as it is now since it invaded in 2001? According to Husain Haqqani, Pakistan’s former ambassador to the US, "the United States does not lose wars; it only loses interest." He explained that "poor backwater" Afghanistan turns "strategically significant" only when a hostile power tries to control it. Since their birth in 1994, Taliban has engaged with US government which urged it to shut down Al Qaeda training camps in Afghanistan. California-based Unocal Corporation also flew core Taliban members to Texas to negotiate two oil and gas pipeline projects. However, the 1998 bombings of the US embassies in Nairobi and Dar es Salaam, claimed by Al Qaeda, brought an end to all US-Taliban contacts. Immediately after the 9/11 attacks, then US President George W. Bush swiftly rejected every offer made by the Taliban to discuss handing over wanted terrorist Osama bin Laden to a third country and ordered an invasion. The subsequent US-led occupation since 2001 resulted in the deaths of about 104,000 people, an Afghan civilians’ casualty report claimed. "Taliban gathered strength thanks to rampant corruption, the power vacuum and Pakistan’s continued support"
The superior US-led coalition firepower swept out the Taliban within weeks. However, peace did not return to Afghanistan anytime soon. Bush focused his attention on Saddam Hussein and invaded Iraq, while US military commanders increasingly relied on notorious warlords, including corrupt local "thugs" who formed "an entrenched, kleptocratic system that stretched all the way to the top of the Afghan government," an approach that alienated ordinary Afghans and brought more atrocities and hardship. At the same time, Taliban gathered strength thanks to rampant corruption, the power vacuum and Pakistan’s continued support. In December 2011, over a decade after the 9/11 attacks, then Afghan President Hamid Karzai warned at an international conference in Germany that the "Taliban could make a comeback and take over Afghanistan again." Today, the Taliban – despite killings of its top leaders including spiritual founder Mullah Omar – stands at the gates of Kabul with strong armed presence all over the country. To make matters even worse, ISIS emerged in Afghanistan and named itself as "Khorasan province" when some renegade Taliban commanders pledged allegiance to Abu Bakr Al Baghdadi in early 2015. Despite facing heavy defeats by the Taliban and US-backed Afghan National Army (ANA), ISIS still remains a powerful insurgent force and routinely mounts deadly terror attacks in Kabul and other cities. Both ANA and the Taliban are downplaying the consequences of inevitable US troops withdrawal on their fight against ISIS with top Afghan government officials insisting it "will not affect the security situation of the country" while the Taliban urging the United States to leave the country after its military defeat in Afghanistan. After spending a staggering US$1.6 trillion on the Afghan war and reconstruction, it is becoming clear that Trump’s decision is primarily about not wanting to be involved in expensive wars. While it could mean more bloodshed for Afghans, the decision also paves way to the influence of other foreign powers. Russia are reportedly brokering peace talks between the Taliban and Afghan high peace council, which comprises tribal elders, alongside representatives from Iran, China, Pakistan, Tajikistan, Uzbekistan and Turkmenistan. 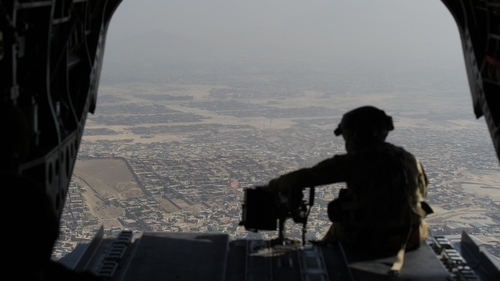 Whether US and other foreign troops stay in Afghanistan or not, the prospects of peace remain as distant as ever before. This is due to the competing interests of Afghanistan’s neighbours, the rise of Taliban and other extremists, the failure of the Afghan government to provide basic services and security to its citizens and the international community’s reluctance to follow up on its promises and rebuilding engagements.